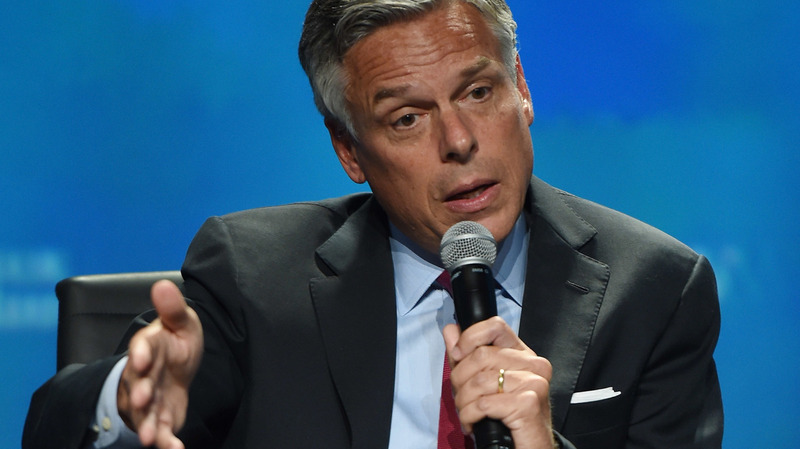 Trump Reportedly Selects Jon Huntsman As U.S. Ambassador To Russia : The Two-Way Responding to reports of Huntsman's selection, the Kremlin says it would welcome any U.S. ambassador who wants to create a dialogue with Russia. Former Utah Gov. Jon Huntsman Jr. would face Senate confirmation before his reported selection as the U.S. ambassador to Russia would become official. President Trump has reportedly offered former Utah Gov. Jon Huntsman the job of U.S. ambassador to Russia. Huntsman has been a U.S. ambassador twice before, in Singapore (1992-1993) and China (2009-2011). Like all ambassadorships, the position requires Senate confirmation — but the diplomatic posting to Moscow was expected to face particular scrutiny in light of ongoing investigations into Russia's attempts to meddle in U.S. politics and reports of repeated contacts between Trump's campaign and Russian officials. Responding to reports of Huntsman's selection, Russian presidential spokesman Dmitry Peskov says the Kremlin would welcome any U.S. ambassador who wants to create a dialogue with Russia. "After openly celebrating Donald Trump's election victory as a breakthrough in U.S.-Russian relations, Moscow has since adopted a more cautious tone. Russian officials argue that several investigations into Kremlin interference in the election, as well as alleged ties between the Trump campaign and Moscow, have forced the Trump White House to abandon its goal of improving relations." Speaking to reporters Thursday, Peskov said the choice of ambassadors is up to Trump, adding, "We have no intention to meddle in these internal affairs." Back in the summer of 2011, Huntsman entered the race for the Republican presidential nomination; he dropped out in January of 2012. At the time, Trump was a vocal critic. Weeks after Huntsman ended his presidential bid, Trump tweeted: "Jon Huntsman called to see me. I said no, he gave away our country to China!"